Stress, Anxiety, or Boredom taken oven? 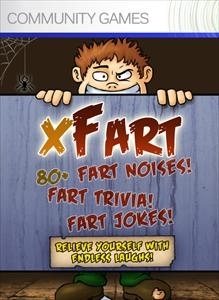 Well relieve yourself with the most useful game on earth, xFart! With world wide appeal xFart will provide relief to all with endless laughs. Let it rip with xFart's 80+ different farts, 50+ Fart Definitions, a 100+ Fart Chart, and 50+ Fart Jokes that will split your seams, 35 Fart Trivia questions, and a custom soundtrack with all your favorite fart hits!